Martensen IP helped PayJoy secure its intellectual property, gain market credibility, and give confidence to potential investors. The area of finance-related phone apps is one where it can be challenging to obtain patent coverage. However, we saw that there were unique, and therefore patentable, elements of the technology. And just as importantly, we saw that the inventor had the desire and the drive to make his company successful in the long term. Little did any of us know that success would come sooner than expected. To secure PayJoy’s intellectual property (IP) while being mindful of the company’s budget, we efficiently and cost-effectively filed a number of U.S. patent applications. After filing an international patent application (Patent Cooperation Treaty application) to preserve a U.S. filing date on core innovations, we went on to file paperwork in multiple individual countries around the world. 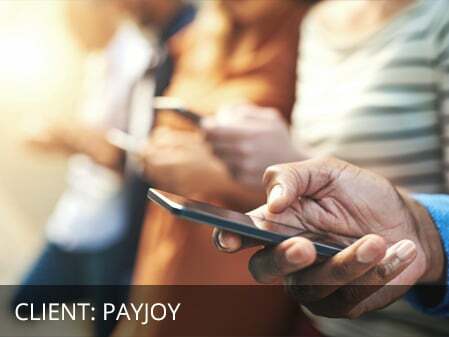 Today, just three years after our introduction to Doug, and four years after our introduction to PayJoy, the now-thriving company has pending or issued patent coverage for its core technologies in the various countries in which it operates, including issued U.S. Patents Nos. 9,973,579 and 10,075,577. Plus, a third U.S. patent application has just been allowed. The fact that PayJoy has legal protection for its IP provides a number of benefits. Not only does it give the organization security from potential lawsuits, it also gives them credibility and reassures potential investors. Typically, startup companies cannot progress past a certain point until they can satisfy interested parties that their innovations are secure. PayJoy has cleared that hurdle and is hard at work advancing and marketing its products.